The family of an 11-year-old boy who disappeared last month in Kavango West wants the environment ministry to kill the crocodiles that killed him. Kativa Haipanda, whose body has not been found, disappeared from Gcwagi village near the Okavango River on 19 January this year. His uncle, Thomas Kasinga, told The Namibian yesterday that Haipanda and his friends were herding cattle, and decided to drink water in the river. "When they got to the river, Haipanda was the first to drink and was attacked by a crocodile. The children, who were younger than Haipanda, were the only witnesses. They came to inform us that a crocodile had taken Haipanda. "We immediately went to the spot where he was attacked and even saw some crocodiles there. At that moment, we could not do anything but wait for the police to come," he explained. Kasinga added that when the police arrived, it started to rain heavily and not much could be done. "Police came the next day to search with the help of the environment ministry officials. However, until now, they had not found the remains. We believe that crocodile ate our boy. There are no remains left," he lamented. 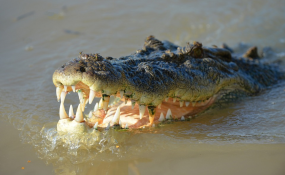 Kasinga said the environment ministry should kill these crocodiles because community members are afraid to go to the river to fetch water because many people have already fallen prey to the reptiles. "We cannot continue losing lives like this. The environment ministry cannot even compensate us now because we do not have a death certificate as the body was not found. "We also went to see a magistrate at Rundu to help us, but they told us there is nothing they could do unless the ministry kills these crocodiles and retrieve even a bone belonging to my nephew for them to issue a death certificate. We do not know what to do now, and we feel hopeless," he stressed. Haipanda's mother, Roswitha Kasinga, told the NBC over the weekend that the ministry should at least kill the crocodiles found at the site to try and retrieve the body. Kavango West regional police commissioner Josephat Abel told The Namibian yesterday that an inquest has been opened. "Since the incident happened last month, we have been searching for the body of the boy with officials from the environment ministry, but we did not get it. We will present our findings to the inquest magistrate, who will then be able to declare the boy dead or not. So, the family will only get the death certificate after the declaration by the magistrate," he noted. Abel further advised community members living along the river to take precautionary measures when going to the river because, during a rainy season like this, the presence of crocodiles is high. "The community members should not allow children to go to the river alone, and even adults should be cautious when they go to the river to get water or wash clothes. We know these reptiles live in the river, so we cannot do anything but make sure it is safe when you go there," he advised. Environment ministry spokesperson Romeo Muyunda yesterday said the human-wildlife conflict policies provide for putting down an animal which is deemed responsible for killing a person. However, this could only be done after thorough investigations, and if there is a need. "As far as the compensation part goes, we can only look into it when the body is discovered, and it is only then that we will do investigations to see whether we will pay or not. For now, we have assigned our officials to assist in finding the body of the boy," he added.